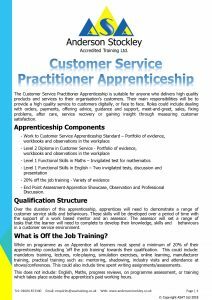 The Customer Service Practitioner Apprenticeship is suitable for anyone who delivers high quality products and services to the customers of their organisation. Their main responsibilities will be to provide a high quality service to customers which will be delivered from the workplace, digitally, or through going into the customer’s own locality. Jobs could include dealing with orders, payments, offering advice, guidance and support, meet-and-greet, sales, fixing problems, after care, service recovery or gaining insight through measuring customer satisfaction. Over the duration of this apprenticeship, apprentices will need to demonstrate a range of customer service skills and behaviours. These skills will be developed over a period of time with the support of a work based mentor and an assessor. The assessor will set a range of assessment tasks that the learner will need to complete that will help to develop the apprentices knowledge, skills and behaviours in a customer service environment. The end point assessment consists of 3 parts, the Apprentice Showcase, Observation and Professional Discussion. The Showcase enables apprentices to reflect and present examples of their development over the on-programme period. The showcase will be assessed either face to face or remotely. It can be showcased through a presentation by a virtual form of assessment such as a report, storyboard or journal. The discussion will be a structured discussion following the observation. This is to establish the apprentice’s understanding and application of knowledge, skills and behaviours. The discussion will last no longer than 1 hour. There are no specific entry requirements, however some companies will have their own entry requirements. All learners will be required to carry out Initial Assessments in Maths and English, prior to enrolment on the course. Learners will need to be working a minimum of 30 hours a week to meet the apprenticeship funding guidelines.